One small boy. One magical box. One big adventure. Star Boy is a tale of a small boy who loves to explore. As he is falling asleep one night he sees a shooting star and decides to go in search of it. His quest to capture the star takes him through the dark woods, over and under the sea and finally into space. But does he get his star? Come join Star Boy on his amazing adventure and share in his discoveries. 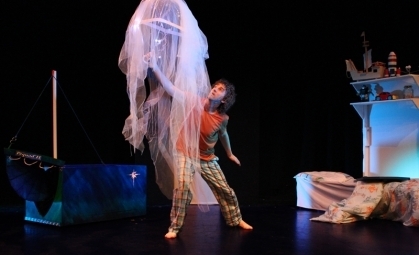 Star Boy is an early years theatre performance by Joe Brennan. The piece is suitable for all those 3 – 7 years containing no words.